We spend a vast majority of our time cleaning indoors, and for good reason. But we sometimes forget that our outdoor spaces need cleaning too. Outdoor floors can be made of anything from concrete floors to wooden decks, and they each require different methods of care. Outdoor floors must be maintained so that they do not accumulate dirt and discoloration. Occasionally, deeper cleaning is needed in order to disinfect or remove stubborn stains. There seems to be a misconception that outdoor spaces can be cleaned using anything you have available, including harsh chemicals and materials. However, as we’ll learn, just because a space is outdoors doesn’t mean that it is tough enough to withstand harsh cleaning methods. In place of these methods, we’ll offer some alternatives. Concrete is a great example of a material that many people don’t feel needs cleaning. But regular maintenance of your concrete surfaces will help them last longer and look a lot better. Cleaning methods will also depend on whether or not your concrete is sealed. Depending on the space purpose and location, a sealant makes the floor look nicer and makes it easier to clean. For now, however, let’s assume your concrete floor is not sealed. Though concrete might look tough, even weak acid products can cause damage. Instead, use Metso Green Concrete Cleaner mixed with hot water and scrub with a brush meant for outdoor use. The Metso Green powder is orange, and it turns green when mixed with water. Let the mixture stand for aproximately 2 hours before washing off. Metso Green works on tough oil stains, and it is commonly used in auto repair shops and garages. Just like for concrete, acid cleaners are too harsh to be used on brick and unglazed tile. Instead, use try Attack Mildew and Stain Remover to get rid of dark stains such as mildew and moss. Let it stand on the brick for 5-10 minutes, then scrub with a course brush to lift the stains (don’t forget your PPE). Finally, rinse with water. This product can also be used in a pressure washer by diluting one quart per 5 gallons of water. Like concrete, wooden decking is easier to clean, will last longer, and will look nicer if it’s sealed. But not too fast: only some kinds of wood should be sealed. Others are fine if they are not sealed. To remove bird droppings and mold, mix Oxy Care with warm water and use a soft-bristle brush to scrub. Not only will it clean your deck, but it will help control mold by killing spores. Do not use chlorine bleach, as it is too harsh on wood and deteriorates the wood fiber over time. 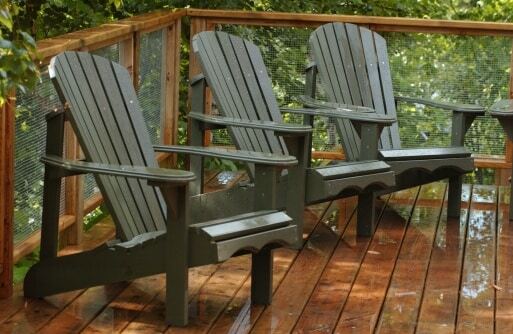 You can also use a power washer to remove built-up stains and dirt on your deck. Make sure not to use too high of pressure on the pressure washer, and always move with the grains to protect the wood and deliver the most effective cleaning. Dish soap is a surprisingly effective cleaner for natural stone. The grease-fighting agents of the dish soap help to release difficult stains from stone and brighten its color that may have deteriorated due to buildup of dirt and other materials. Apply the dish soap using a soft-bristle brush, then rinse with clean water. Alternatively, you can use a power washer. Never use chlorine bleach on stone as it can damage the surface permanently. In the event that you need to disinfect stone, use a non-chlorine bleach disinfecting solution, such as Pure Pine 20 Disinfectant. No matter what surface you need to keep clean, Worldwide Janitor has the products required to get the job done. The rule of thumb for all outdoor surfaces is to use the gentlest method and solution possible for the particular surface, and to avoid extreme cleaners such as acid cleaners whenever possible. Using the right method for your surface will not only ensure that it is sparkling clean, but that the material stays in great shape for years to come. What is your favorite tip for cleaning your outdoor surface? Please share it in the comments! This entry was posted in Dishwashing, Disinfectants, General Cleaning and tagged All-Purpose Neutral Cleaner, Attack Mildew &Stain Remover, metso green concrete cleaner, Oxy Care, Pure Pine 20 Disinfectant, Superior Dish Wash Soap. Bookmark the permalink. Outdoor areas aren’t usually cleaned as much because most of the issues, like leaves and mud, just happen again really quickly. But no matter, they still need to be cleaned. You wouldn’t wear pants that you never clean would you?